White shorts, with white drawstring. Red seams, with a thin royal blue vertical stripe on each side. Red logo, overlaid with 'Admiral' in royal blue title case lettering on left thigh on a white embroidered patch. Red socks, with thick royal blue stripe across tops, overlaid with red logos, but without the 'Admiral' lettering. The Admiral logos were removed from the shirts and shorts against France. Against West Germany, the white line across the breast was replaced by a thicker white band, with the blue line in the middle of it, and lowered to below the v-neck, with the blue line broken only by the point of the v-neck. A red logo with 'Admiral' in white was worn at the base of the first digit of the shirt number in the last game that the shirt was worn, against Greece at Wembley. Against France, England wore red numbers on the right thigh in a different font to that on the reverse of the shirt. Against West Germany, England wore the white shorts of the 1976 red uniform, with the red Admiral logo that had been added in 1981. They wore white numbers, outlined in black, in the same font as the red numbers worn against France, again on the right thigh. The same style of white numbers had been worn on the blue shorts of the white uniform earlier in the World Cup tournament. England wore the white socks of the 1974 white uniform against France. Twenty England internationals appeared in this shirt. Kenny Sansom also made most appearances in the white 1980 shirt. Sammy Lee was the only player to make his international debut in this shirt. 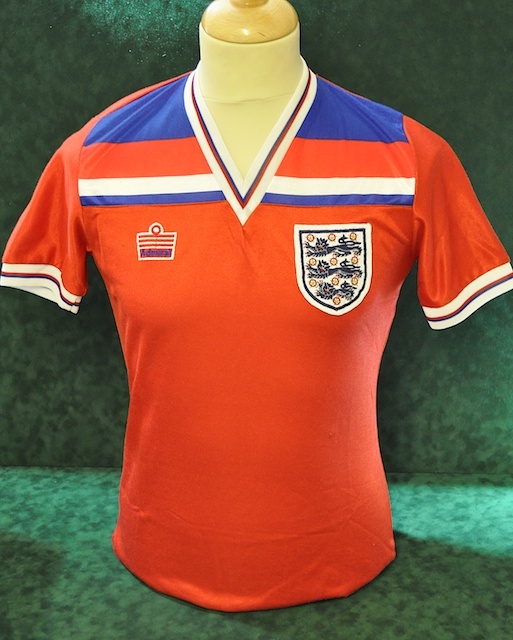 Three players made their last international appearance in this shirt and, curiously, two of them (Steve Coppell and Phil Thompson) were each winning their 42nd cap. The other player ending his England career in the shirt was Tony Morley, whose last cap was his sixth. All of both Robson's and Mariner's goals were scored in the first two games that the shirt was worn. Sammy Lee scored the other goal, in England�s 3-0 win in Greece, making him the only player to score his first England goal in the shirt. Kevin Keegan captained England for the 31st and last time in his last full game for his country. Bryan Robson captained them for the first time in this shirt. Following the launch of Admiral's second white shirt in 1980, it was a further two years before the second red shirt appeared, just as the first had had to wait a couple of years after 1974. This time, however, England wore their 1976 red shirt twice more after the new white shirt had been introduced. When the new red kit did arrive, England were preparing for their first World Cup tournament in 12 years. 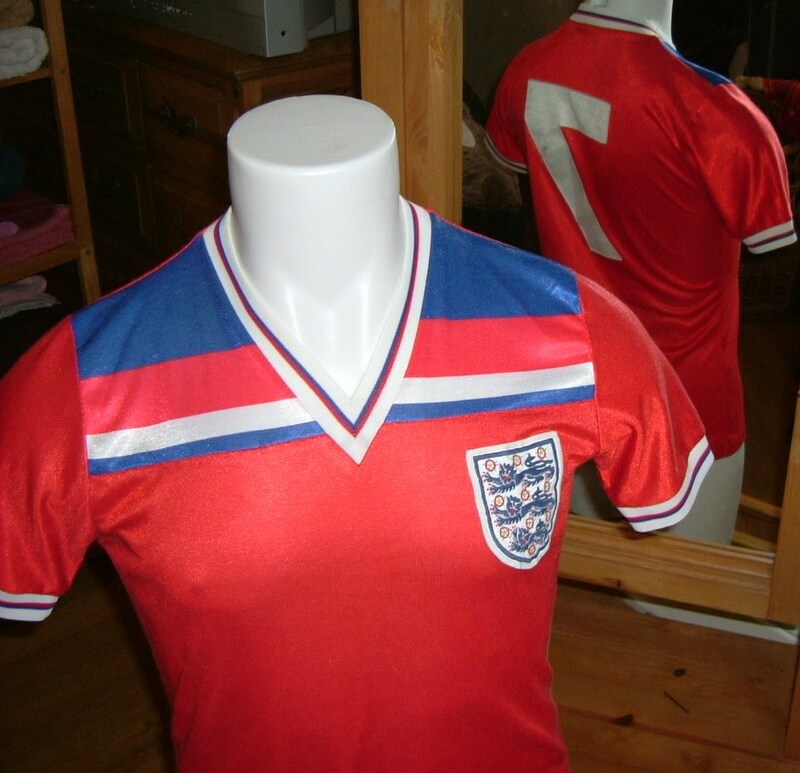 It was the same design as the white kit, so it didn't have quite the same impact, but it was soon subjected to a series of strange inconsistencies when it came to the seemingly simple task of sending out an England team in the same kit for each game. To begin with, the Football Association seemed to be under the mistaken belief that teams were not allowed to display kit manufacturers' logos on the strip, just as they had been barred from doing at the 1980 European Championship. So, the kit worn against France was devoid of them. A new lightweight red shirt was introduced against West Germany. 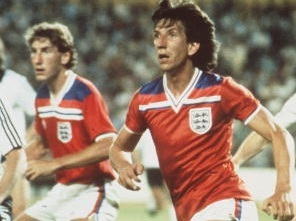 For some inexplicable reason, the design had changed, and as nobody seemed to have spotted this at the time, at least two players were allowed to change into the polyester shirts with the original design, at half-time, as illustrated by Paul Mariner's shirt (right - Terry Butcher is also seen sporting the revised design worn at the start of the game). England also had problems with the numbers displayed on the shorts. They were red against France, but Mariner's had fallen off by the end of the game! Against West Germany, they instead wore the white numbers worn with the navy shorts and, of course, virtually invisible on a pair of white shorts! For some other strange reason, the shorts were not the ones worn in the two previous games featuring this design. They were the old design worn the previous year, with a simple red and blue stripe at the seam. 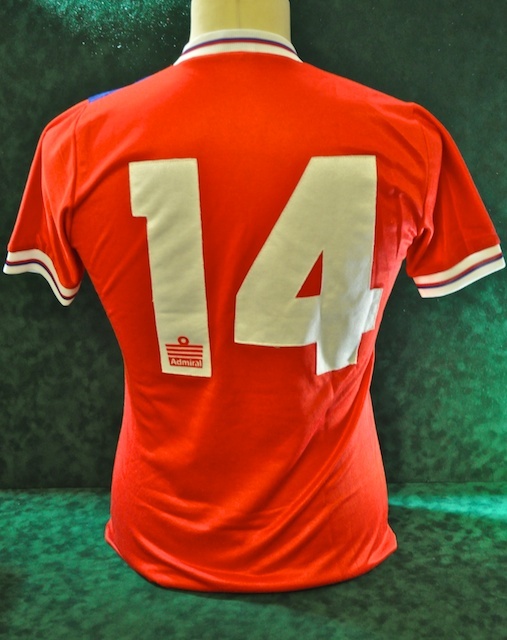 Unlike the replacement white shirts worn against Kuwait in the same World Cup tournament, the revised red shirt did not have an additional Admiral logo at the base of the numbers on the reverse, and it was to be a further nine months before this was added to the shirts worn against Greece. Alas, there was no further requirement for this kit to be worn after that. The only conclusion we can make from this sorry state of affairs is that no one was responsible for ensuring that there was any consistency and continuity in England's kit from one game to the next. It would appear that there were too many variations being added haphazardly. To be fair, no one noticed at the time and it's only been by studying photographic evidence that we can make these observations. One further mix-up featuring this uniform probably also occurred before the game with Greece, five months later, when both teams appeared in their second-choice kit, resulting in each wearing dark shirts (Greece in blue, England in red) and white shorts. Strangely enough, exactly the same thing had happened when England had last visited Greece, in 1971. On that occasion, because the majority of viewers had black-and-white television sets, Greece changed into blue shorts at half-time. In 1982 though, it was not such an issue, but nonetheless, an illustration of the lack of prior communication when it came to agreeing the colours to be worn. The shirts displayed at the top of the page are those of Graham Rix (number fourteen issued against Greece at Wembley) and Kevin Keegan (number seven issued for the 1982 World Cup). Rix came on as substitute against Greece, with England wearing Admiral logos on the reverse for the one and only time in this shirt. Keegan was injured when England wore the shirt without any logos against France. Many thanks to Simon Shakeshaft, curator of the National Football Shirt Collection at England Match Shirts (part of the Neville Evans Collection), for the Rix shirt photos and to Richard Clarke's 'Three Lions - England Match Worn Shirts' Facebook Collection for the image of the Keegan shirt. Notes England wore the red away shirt with white away shorts, but wore the 1974 white home socks, against France. The kit bore no Admiral logos. Notes England wore a variation of the red shirt, the blue line across the chest was in the middle of the white band, instead of underneath it. The shorts were from the 1976 red uniform, with the newer style red, white and blue Admiral logo. These shirts became commercially available for Christmas in 1982. The price of this red Admiral shirt ranged from �8.49 for a 26" chest shirt, to a whacking �11.99 for a 38" chest shirt. The shorts started at a modest �5.00, to the larger �5.50. All socks were �2.25.